NewVistas, Antal soon discovered, was started by a wealthy Mormon engineer named David Hall, who wants to build sustainable, high-tech, high-density communities all across the globe. From the looks of things, he hoped to build one right in her backyard, in rural Vermont. Hall’s community plan, pictured on the right, is based on a vision recorded in 1833 by Joseph Smith, founder of the Mormon church. Hall hopes his communities will be replicated throughout the world. When Antal’s story was posted on Daily UV two weeks later, it sent Vermont into a frenzy. The Associated Press, National Public Radio, and several local papers produced follow-up stories. Concerned citizens formed a Stop NewVistas group. “New Vista? No Mister!” read one Facebook post. Some Vermonters worried Hall was buying the land to serve as headquarters for a Mormon cult. 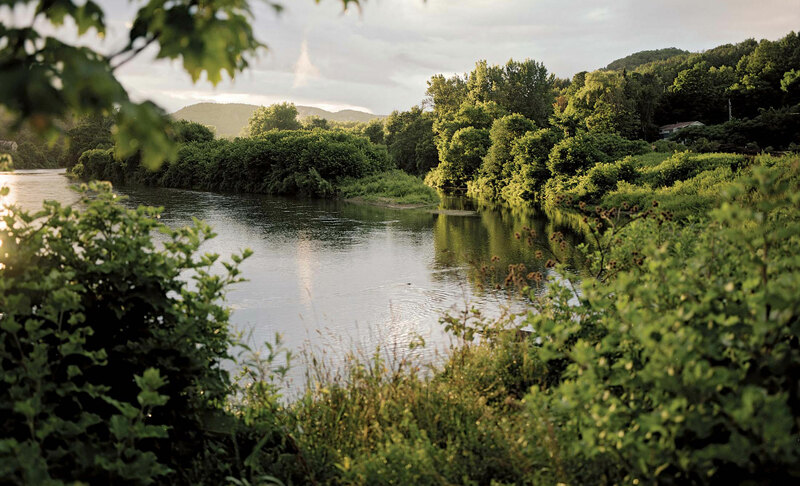 Witnessing the uproar, an opportunistic PR firm contacted Hall and offered to help him navigate the peculiar minefield that is Vermont, the 49th-most-populous state with only 626,000 residents—famous for being fiercely proud, idealistic, and ornery. (See: Bernie Sanders.) “It was clear that this guy was gonna need help,” said Bryan Mills, a partner in the firm. Hall hired Ellis Mills Public Affairs, and kept buying land. As of June, his foundation had purchased 1,263.9 acres, spending $4.9 million. And that wasn’t all. He soon revealed he didn’t want just one Edenic settlement in Vermont. He hoped to build 1,000 NewVistas developments, housing 20 million people. “I gasped,” Antal says. At 69, Hall is tall and rosy-cheeked, with bright white hair and a quiet, friendly, yet determined demeanor. He often slaps the table with the palms of his hands, or throws them to his forehead, cringing, when describing the environmental and societal ills he hopes to solve with his Smith-inspired communities. Hall is funding the project with money from Novatek, a fossil fuel drilling equipment company he built over 40 years and sold last fall; his net worth is reported to be a nine-figure sum. Hall says he’s already spent more than $100 million on NewVistas and plans to spend at least $150 million more. Hall’s master plan, laid out in a 26-page single-spaced document, can be found online. The overarching mission is to achieve “global environmental balance by building a network of environmentally and socially sustainable villages, communities, and megalopolises.” The first, he says, will likely be built in Provo, where he’s also in the process of amassing 5,000 acres (and meeting with significant pushback from the community). Once that’s up and running, he’ll move on to Vermont and then across the globe. The plats, Hall says, are designed to incorporate agricultural, industrial, commercial, and residential space. The entire community is pedestrian and exploits layout tricks to sustain individual privacy and views of nature. Rooftop farms will make use of advanced techniques drawn from marijuana cultivation, and box-shaped greenhouses will improve yields and prevent the spread of disease and insects. Ground-floor spaces will be occupied by businesses, all connected by enclosed walkways and space for moving “pods” that transport the sick and elderly. Within the community, each person will be allotted just 200 square feet of living space, but apartments will be soundproofed, with Roomba-sized robots that rearrange furniture for different needs and times of day. Each robot, Hall says, will move quickly, “then go right back into its nest.” Furnishings and possessions not being used will be stored inside 4-by-4-foot boxes that are integrated into the apartment floors and electronically move up and down as needed. “We’re still a few years off from having that work, but it’s not Dreamsville—it’s technically feasible,” says Hall. (And on trend: NArchitects has just completed a 55-unit building of 260- to 360-sq.-foot apartments on Manhattan’s Lower East Side, though it relies on solutions such as Murphy beds instead of robots.) Multipurpose buildings will serve as schools, conference centers, sports halls, and houses of worship, both Mormon and non-Mormon. To help maintain wilderness and animal habitat, and stop urban sprawl, each community will be surrounded by thousands of acres of unplanned nature. Livestock will also be kept outside the towns—along with what he calls “sustainable drilling sites,” used to extract building materials and natural resources. A plat, says Hall, will be subject to state and regional laws, but will also be overseen by a board and hierarchies of leaders with, it appears, strong Mormon family values. “Each [multi-family] house has house captains, which are a team of one man and one woman,” reads Hall’s document. “These are a selected married couple, with each providing leadership for and dealing directly with issues related to their gender.” Asked in person about this traditional-sounding setup, he said that gay and single people could hold leadership positions. Legally, the communities will be owned by a trust that operates two for-profit entities: a property holding company and a capital fund that controls intellectual property and most financial assets. Families and individuals who wish to join must invest their net worth and be employed either outside the communities or by a NewVistas company, or Vista Biz. Those who start Vista Bizzes will be given startup funds by the community but must surrender their IP rights. They also must agree to put nearly all their profits back into the community in exchange for what Hall calls “dividends”—payouts from overall wealth earned by the plat businesses. But everyone is also free to leave and take their companies with them, if dissatisfied. “Competition and the freedom to walk is crucial,” he says. Not far from downtown Provo, Hall has built what he calls a “modern-day Edison lab” at the site of a defunct steel mill, with grand views of Utah’s Wasatch Mountains. There are 12 industrial buildings housing 25 companies—five of which are run by Hall’s five children—developing technology for the settlements. One Vista Biz, called Medic, is developing a water-efficient toilet that also measures blood pressure, weight, and overall health by using sensors and sampling what passes through it. Hall hopes insurance companies will eventually cover the costs of installing such toilets at companies to track worker health. “Instead of going to the doctor for a checkup, the doctor will call you when something is wrong,” he says. Another company, the Building Elements Group, is designing a 4-by-4-ft. kitchen and narrow, lightweight elevators for tiny homes. Hall plans to market these products as soon as they’re viable and use proceeds to help fund his first NewVistas community, which he says will likely require at least $3 billion. This fall, he also plans to break ground on a Provo hotel that will incorporate NewVistas innovations, where he, his wife, Karen, and some employees will field-test life in close quarters. Inventors and tycoons—not to mention architects and cult leaders—have long been tantalized by utopias of their own construction. In the early years of the 20th century, Thomas Edison grew obsessed with concrete and sank millions of dollars into a future in which people would live in concrete houses, lounge on concrete sofas, and play études on concrete pianos. Convinced the cheap, fireproof material would eventually replace wood and stone, he published a book, The Romance of Cement. His ideas proved prophetic; much of our urban construction is now concrete. But the expensive, impractical method he patented for manufacturing concrete homes in a single pour never caught on. In 1921, Edison’s friend Henry Ford caused a run on Alabama real estate when he announced plans to tack a 75-mile-long city onto Muscle Shoals. This “new Eden,” as Ford called it, was to support industry without destroying agriculture or creating urban sprawl, in such a way that workers would never be far from nature. Those plans never came to pass, but in 1928, Ford broke ground on Fordlandia, a large rubber plantation and city in the Brazilian Amazon. It included a power plant, hospital, library, and golf course, as well as employee housing and hamburgers for all. But workers soon rioted, unhappy with the Western diet and values and having to work 9-to-5, rather than in the cooler morning and evening hours. Ford also didn’t know how to farm rubber trees, and the city was abandoned. Dilapidated structures still remain—an Ozymandias-in-the-jungle reminder of Ford’s folly. Inventors like Buckminster Fuller have also proposed architectural cure-alls, such as building a giant geodesic dome over Manhattan. “The cost of snow removal in New York City would pay for the dome in 10 years,” he wrote in 1960, according to Wade Graham’s Dream Cities: Seven Urban Ideas That Shape the World. More recently, Peter Thiel, the litigious libertarian venture capitalist gave $500,000 to found the Seasteading Institute, which aims to establish floating autonomous communities in international waters. Meanwhile, Google’s parent company, Alphabet, operates Sidewalk Labs, which reportedly plans to solicit bids from cities to build “digital districts” filled with driverless cars, high-speed internet, and more efficient infrastructure for water and electricity. Perhaps farthest along is Songdo, the South Korean community being built on reclaimed swampland. In what has been dubbed The World’s First Smart City, trash is sucked from apartment and office buildings into underground pipes, automatically sorted and recycled, buried, or burned for fuel. None of these attempts has been perfect enough to get swept off to heaven, but that hasn’t deterred Hall. “They didn’t have this,” he says, pointing to his Plat of Zion poster. Improved drilling technology, including the use of synthetic diamonds, would allow for drilling closer to home, Hall thought. Years later, after getting his engineering degree from Brigham Young University and an MBA from Rider University, he took over his father’s company, H. Tracy Hall Inc., which became Novatek and grew to be worth more than $100 million. Last fall, Hall sold the company for an undisclosed sum to Schlumberger, which calls itself the world’s largest oil-field services company. 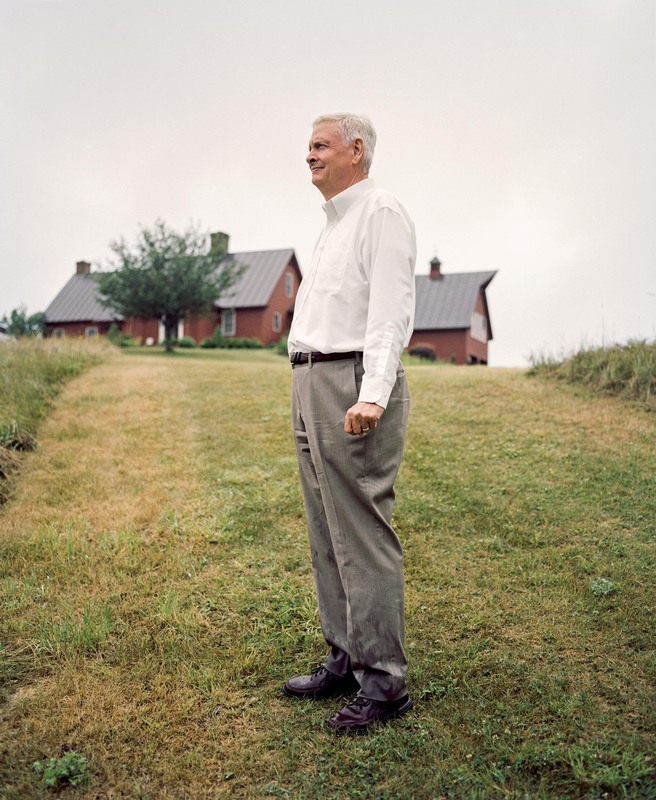 He remains president, though he now spends much of his time on NewVistas, including the increasingly fraught effort in the Green Mountain State. Vermonters, who’ve taken to calling Hall “Diamond Dave,” are ready for battle. In Royalton, the town next to Sharon—Joseph Smith’s birth house spans the border they share—a copy of his 26-page plan is on display at the local co-op, marked up by pen and yellow highlighter. “THIS GUY KNOWS HE IS A SUPERIOR BEING AND THEREFORE ANYTHING US INFERIOR BEINGS HAVE TO OFFER IS IRRELEVANT,” reads one all-caps comment on the front page. Hall’s opponents have put up signs on the streets of Sharon. Even if the NewVistas development doesn’t happen for years, locals worry it will divide the community between those fighting the plan and those hired by Hall to help arrange land purchases and conduct farming experiments. “One question I can’t answer is how that self-sustained community can feed 20,000 people year-round,” says Michael Sacca, a filmmaker who’s lived in Vermont since the 1980s. “He might not know this, but it gets cold here. It’s hard to grow things in the winter.” Sacca’s inadvertently hit on another aspect of Vermont that appeals to Hall: As a location it will test how well his plans can adjust to seasonal challenges. On June 2, Hall arrives in Vermont for a series of meetings. The first takes place on a Thursday afternoon in the Woodstock regional planning office, a former farmhouse overlooking Vermont’s rolling green hills. The air is fragrant with freshly cut grass, and an old dog meanders about the premises unaccompanied. Inside, the meeting room is packed with concerned citizens. Several town representatives are there, along with local journalists. Two days later, Antal is making crepes in her tiny house, which sits on 47 acres of farmland. She and her husband, a computer engineer for Dartmouth College, say they chose to build small only because it was what they could afford. Outside, they’ve dug a well, built and hand-painted a chicken coop, and planted sprawling vegetable gardens. Inside, jars of maple syrup line a windowsill. Robin watches The Lion King in French on a laptop. “I also feel like a hypocrite,” she adds. “It’s like, we need big ideas, we need new ways of living that really address climate change. Then this comes, and I’m like, ‘No.’ ” Hall’s faith in Smith’s plat, his ardor for sustainable drilling, and his obsession with high-density living all terrify her. As does the fact that Hall is getting old and might set plans in motion only to leave them for less passionate, less well-intentioned followers to execute.